As somewhat signalled by the earlier pick swap, Brisbane are backing themselves to rise up the ladder in 2019. And they’ve got another top tier midfielder in Lachie Neale to assist in their rise. At 25, Neale is a fringe All Australian contender and has been a solid contributor for the past few seasons. 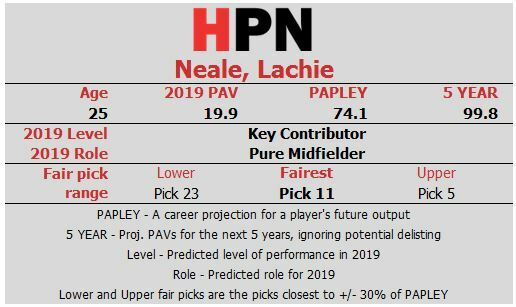 The PAPLEY prediction of 74 PAV may be a little pessimistic on Neale, as his most similar player analysis shows a more optimistic picture. 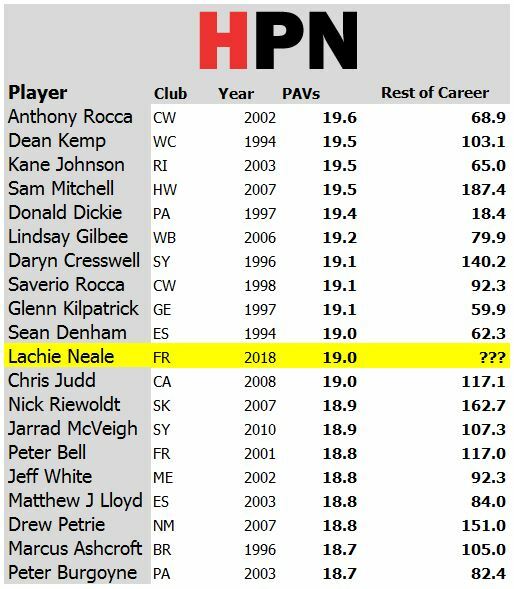 Unlike the earlier Wingard deal, the similar player projection for Neale is extremely rosy with this group averaging right on his 99.8 5 year PAPLEY projection. As a result, there’s a fair chance that Neale outperforms his baseline PAPLEY, which makes the deal a whole lot fairer. Still, Fremantle have extracted a large bounty for their departing near-star, most of it destined for acquiring Jesse Hogan. Brisbane have handed over two first rounders and a third rounder in exchange for Neale and a future second rounder. Brisbane have given up two very good pieces in order to chase for an immediate upgrade, and potentially a shot at the top eight this year. Whether this comes at the expense of a player that could be useful in a Grand Final push down the track remains to be seen. Verdict: Unfair trade. Fremantle walk out the winners. Note: This post is part of a series of posts using a valuation method called Player Approximate Value (PAV) to evaluate trades for fairness and balance. Elsewhere, you can read much more about the method and theory behind PAV and also about PAPLEY, the projection method used to derive expected future PAVs. This method expresses both picks and players in terms of expected future value allowing them to be compared on this common basis. Tim on Wait, are the Suns now good?